Hairstory-Herstory reaches out to women affected by sexual assault, domestic violence and child sexual abuse. Through the collection of hair and writings, lithography and screenprint, the work aims to shatter isolation, facilitate healing and shed light on generational cycles of abuse and trauma. Hair is a physical print of the individual it belongs to. It holds within it a record of ancestral relationships. Spanning eons and cultures, the hair of loved ones has been saved for memorial and spiritual purposes. If undisturbed, hair withstands time, standing as a record of a life or an era. 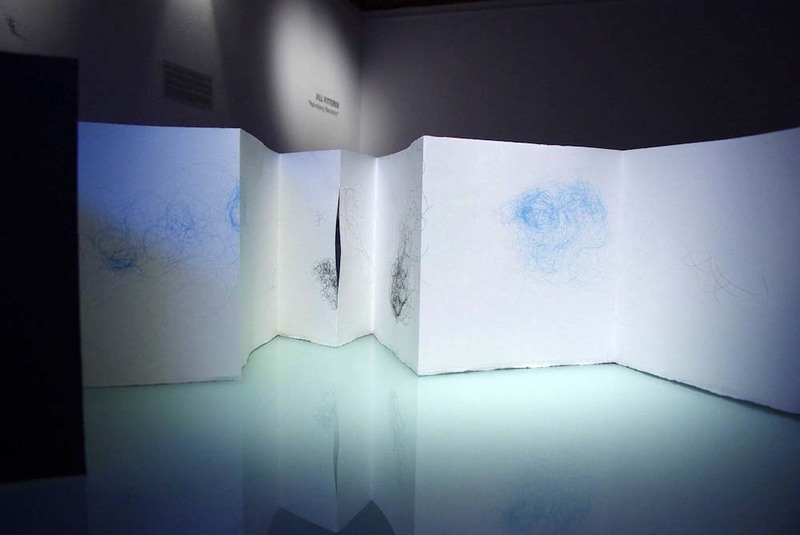 The artist book featured in my images was created in collaboration with the Argentine printmaking residency at La Fundación ´ace para el Arte Contemporáneo in Buenos Aires. Direct exposure of women’s hair created the photo-lithography plates used in the book. The edition number is 5. In April and May of 2014, I collaborated with Idaho City poet, Mary Ellen McMurtrie and co-led writing workshops at the Women’s and Children’s Alliance (a local women’s shelter) in Boise, Idaho. The text in the artist book was graciously donated to the project by one of the workshop participants. The text in the book is in both English and Spanish as is the colophon page. When I created the work, my name was Jill Ingram Fitterer. In January 2015, I changed my name to Jill AnnieMargaret. AnnieMargaret honors four generations of women in my maternal lineage. The project expanded into an international scope in July 2014 with my invitation for an AcePIRAR residency at Proyecto ‘Ace, La Fundación ´ace para el Arte Contemporáneo in Buenos Aires, Argentina. During my residency, I led oral narration workshops with the women at Centre Arminda Aberastury in collaboration with La Fundación ´ace para el Arte Contemporáneo and in Buenos Aires, Argentina. The workshops featured the poems of Chilean poet, Dehlia Dominguez and U.S. poet Dorianne Laux, participants wrote and told stories of their own experiences. Hairstory-Herstory the book is one component of a larger project that seeks social change through an immersive installation of printed silk gauze, vinyl type, audio recordings, hand-pulled prints and mass printed postcards.